(WEST FARGO, N.D. – February 2019) Bobcat Company is providing demolition contractors a line of six new, powerful nitrogen breaker attachments covering all Bobcat® compact excavators, compact track loaders, skid-steer loaders and mini track loaders. The new Bobcat nitrogen breakers deliver powerful impact energy and are built to high quality standards with a simplified design that makes attachment maintenance easy. Devastate demolition jobs with the long piston stroke of the new Bobcat nitrogen breakers, while also experiencing relatively minimal recoil. 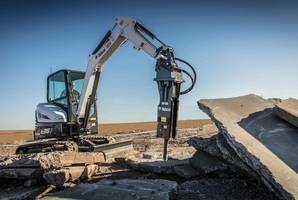 "The Bobcat nitrogen breaker has the impact power customers want for difficult demolition jobs, like removing reinforced concrete slabs,” says Travis Kidder, Bobcat attachment product specialist. The new Bobcat Nitrogen Breakers have minimal internal parts, a single lower bushing and easily accessible grease ports. Each of these design features reduces the breaker’s maintenance requirements and makes rebuilds easier. The unique valve design of the breakers lessens hydraulic pressure fluctuation, which reduces stress on the carrying equipment’s hydraulic pumps. A loader X-Change mounting frame allows owners to transition nitrogen breakers from a compact loader to a compact excavator. This can be beneficial to customers who regularly change attachments between carriers. It’s also a popular feature for rental stores that rent breakers across a variety of compact equipment. Nitrogen breaker tools vary by model and include blunts, moils, chisels and nail points. Customers should consult with an authorized Bobcat dealership to confirm which tools are approved for use with Bobcat nitrogen breakers and carriers. The six models of Bobcat nitrogen breakers are available for purchase now at authorized Bobcat dealerships in the United States and Canada. Bobcat requires the use of a special applications kit when operating a nitrogen breaker. An optional water nozzle kit for dust suppression is coming soon. Approved carriers: Six Bobcat nitrogen breaker models are available to fit T450 – T870 compact track loaders, S70 – S850 skid-steer loaders, MT55 and MT85 mini track loaders, and Bobcat E10 – E85 compact excavators. Bobcat Company, headquartered in West Fargo, North Dakota, is a worldwide leader in the manufacturing and distribution of compact equipment. Bobcat® compact equipment includes skid-steer, all-wheel steer and compact track loaders; compact excavators; mini track loaders; VersaHANDLER® telescopic tool carriers; utility vehicles; Toolcat™ utility work machines and attachments. Bobcat is a global brand with more than 550 dealer locations in North America and the leader in compact equipment – the industry’s original innovator, beginning more than 50 years ago with the first compact machine and predecessor to the skid-steer loader. Bobcat is a business of Doosan Bobcat North America. For more information on Bobcat products, visit Bobcat.com. Framing Hammer offers over-strike protection plate. Concrete Breakers minimize dust and noise. Hydraulic Hammer features 500 lb-ft energy class. Titanium Hammer is offered with magnetic striking caps. Chipping Hammer includes tile chisel.